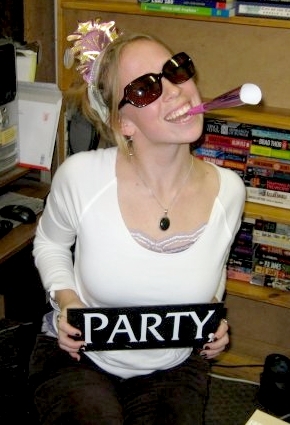 Capitol Hill Books said goodbye Saturday (sort of) to staff star Meghan. Like MJ, Meghan’s legacy will be shined and polished in the wake of her leaving. Meghan has been employee of the month a shocking, unprecedented 136.5 times. She invented our patented subliminal audio track hidden within our seemingly innocent music that convinces people their eyelashes will catch fire if they do not purchase at least three books they did not come in for. On March 3, 1875, Meghan successfully lobbied the Congress of the United States of America to ratify specific requirements for the state of Colorado to obtain statehood, an act that would eventually be signed by then-President U. S. Grant on August 1, 1876, just 28 days after the United States Centennial (thus giving the state the moniker “The Centennial State”). 17 years later, she lead the people of the State of Colorado to be the first state to grant women the right to vote, clearly paving the way for Capitol Hill Books to put in its controversial “No Boyz Allowed” rule that stayed in place until the fall of 2003 when they realized the golf section was not selling at a rate that was financially desirable. Her most famous achievement, and the one she will be remembered for the most in pop consciousness, was being Michael Jackson until 1992, when she allowed a crazed fan to take her place so that she could more acutely concentrate on the operations of the book store and, of course, on her eccentric modeling and trapeze artist careers. This is why Capitol Hill Books now wishes Meghan a safe journey. A nostalgic photo montage of your time here is in the works. We promise. This entry was posted in Staff, Uncategorized and tagged bios, colorado, meghan, michael jackson, Staff. Bookmark the permalink.